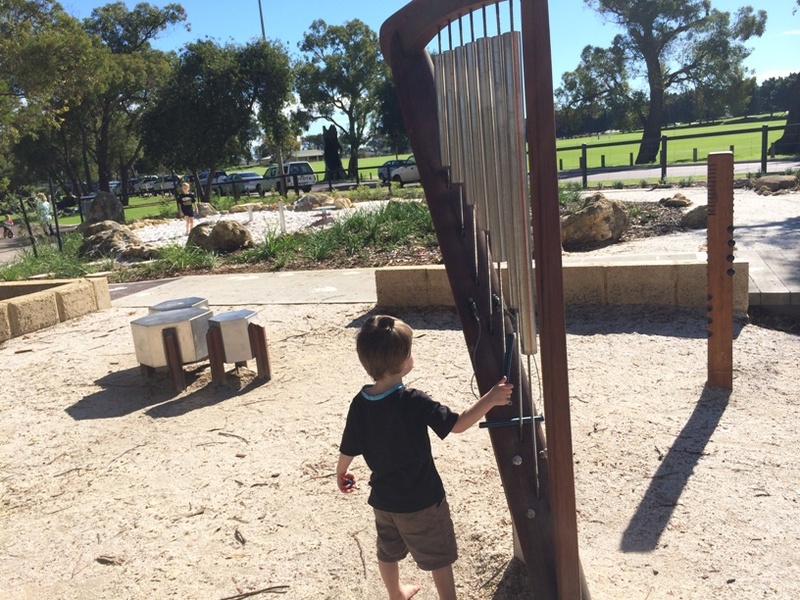 Kingsway Dinosaur Park is a must visit for little dinosaur fans who love to play. 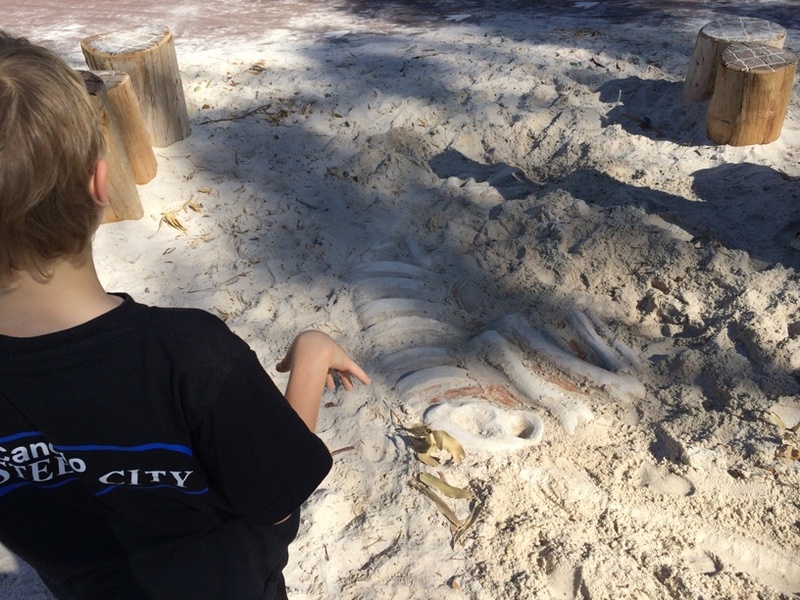 So named because of the large dinosaur statue and dinosaur bones in the sand - this park also has an emphasis on nature based and sensory play and is a little kids play paradise on a nice day. The park is mostly fenced with a couple of small openings and you can find the dinosaur at the front of the park, you can't miss it as you drive in. You can climb on the dinosaur so its a fantastic photo opportunity, my boys were being camera shy on the day. If you look in the sand alongside the wooden logs you will find dinosaur bones, so don't forget to take along a brush or small spade to do some dinosaur digging. This is one of the best playgrounds I've seen for placement under natural shade. 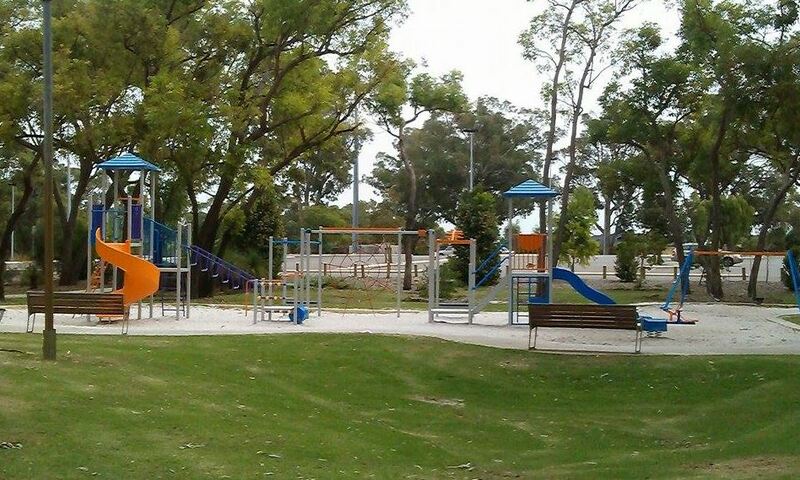 It's well shaded all times of the day and as you can see features low level play features and is designed for toddlers and preschoolers although primary school kids will no doubt enjoy it too. 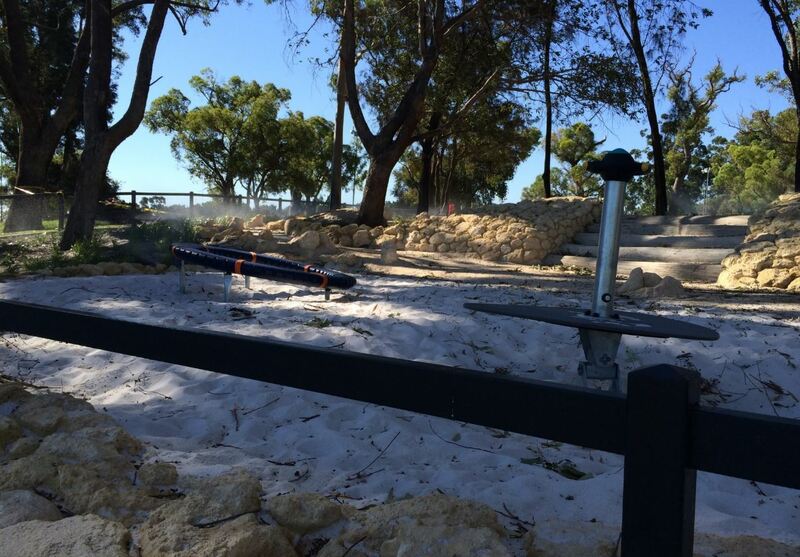 There is a focus on nature based and sensory play at Kingsway Dinosaur Park. 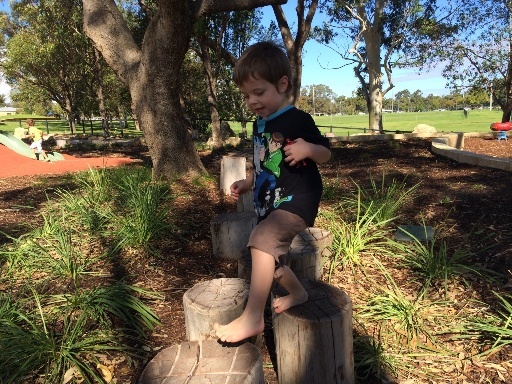 There are balancing logs around the playground, rocks to climb and a musical play area. A small water play feature was also added after our visit, so make sure you bring some spare clothes along. 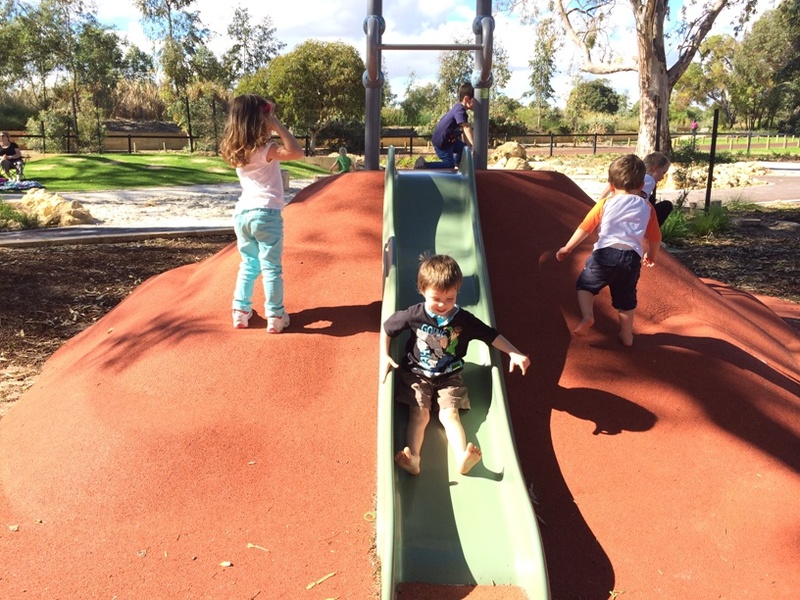 Love how the nature based play is mixed in with the traditional play, the "hill" climb to the top of the little slide was popular with the little ones. 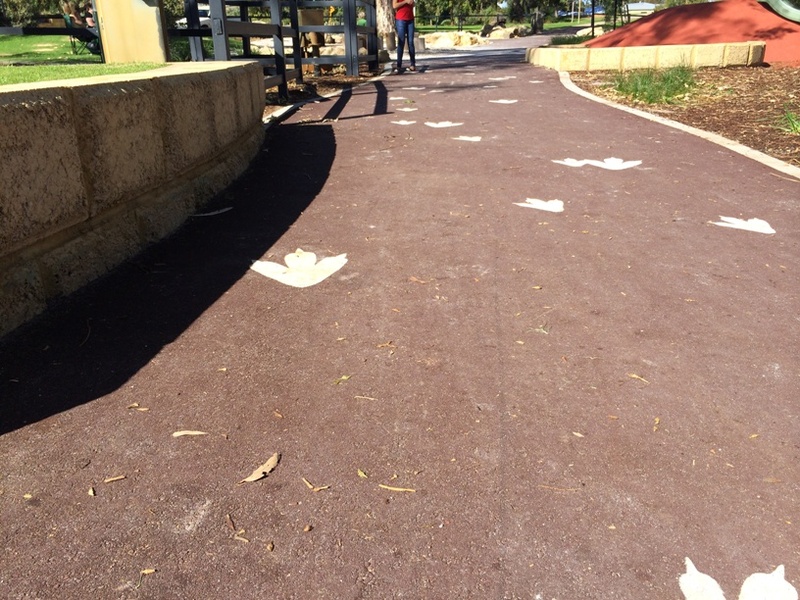 There is a wide path that runs through the length of the playground too, so kids can enjoy riding their scooters or small bikes up and down or follow the dinosaur prints to the big dinosaur statue. If you fancy a bit of a walk yourself, there is a nice round the lake walk just a short stroll from the Kingsway Dinosaur Park. It's only about 200-300m's around and there are lots of ducks that live here. There is a footpath all the way round so kids can ride their scooters or small bikes around, just watch the kids closely around the open water. 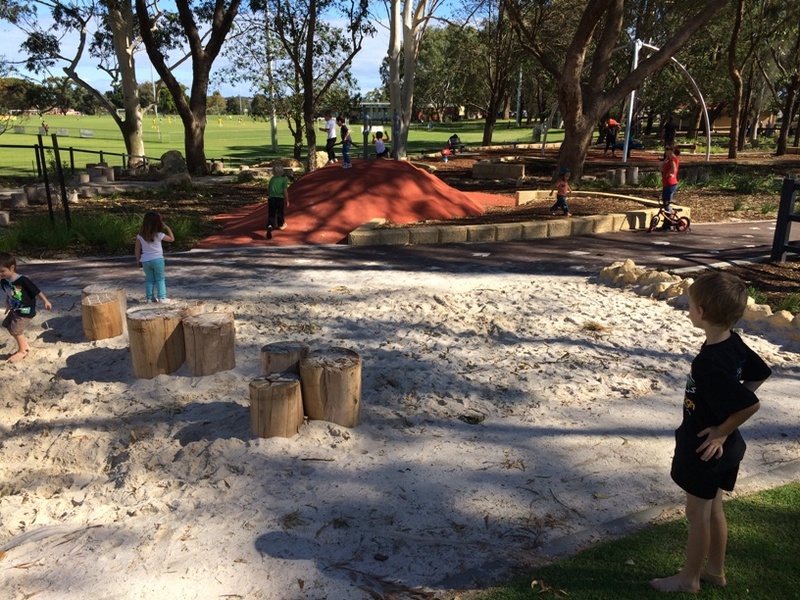 On the other side of the toilet block (which is only 40m from the Dinosaur Playground) is a fairly new tradiitonal playground, something the bigger kids may enjoy too. In between here and the Kingsway Dinosaur Park there are some BBQs and picnic tables, so it's a great place for a gathering or for a dinosaur themed birthday party. 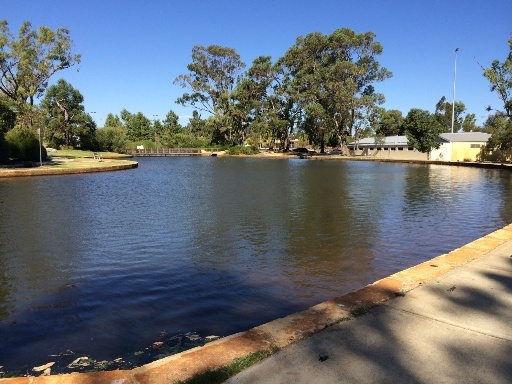 Being within the Kingsway Sporting Complex there is no shortage of room to run around with a range of sporting areas around the play areas. 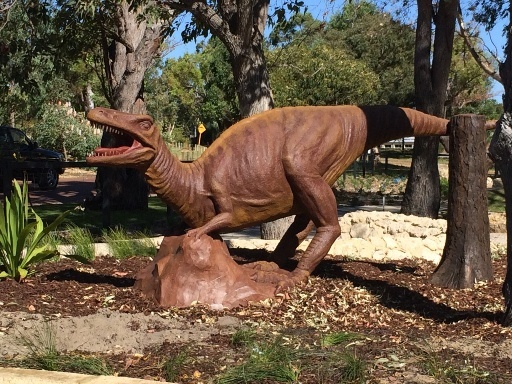 If you have little ones who love Dinosaurs a visit to Kingsway Dinosaur Park is a must. With nature based and sensory play for the little ones, a traditional playground and lots of grassed areas for the big kids, you'll easily be able to play the day away here.